Ventriloquism - Instructions on How To Talk Without Moving Your Lips by Brownielocks. Secrets, Instructions, Tips, Performance Advice and More! Why I am creating this page? Why am I telling secrets? I realize that the so-called secrets of ventriloquism are suppose to be kept among those who are a ventriloquist for the preservation of the art form and to keep it's mystique. I have been a ventriloquist, and it is with a lot of respect to the art form and all others who do perform (whether professionally or not) that I am going to explain "how to talk without moving your lips" secrets as well as some of my own personal views on performing etc. Why? Because today I do not feel ventriloquism is as fascinating as it was years ago. The reason is, I've had so many kids who came up to me asking, "So where are the batteries?" or "Where is the remote control?" Children are not that fascinated by it. Just recently on "America's Got Talent" ventriloquist Terry Fator stated that he gave a performance for a crowd of approximately 1,000 and there was only one 12 year old in the audience. Today's ventriloquists need to appeal to adults, IMHO. And, Jeff Dunham proves that very well. Why? You can thank Hollywood special effects for this. And frankly, it is my own opinion that knowing how it is done has no affect on if a performance is enjoyed or not. My reason for saying this is because I know how it's done and there are vents that I just did not enjoy although they did not move their lips. And those I did enjoy whose lips were not that skilled. This season's "America's Got Talent" ventriloquist, Terry Fator proves that. I know how it's done and yet I love his performances! What makes a good ventriloquist performance IMHO? If you have good jokes and charisma with the audience (just like a stand-up comic) then people will enjoy your act no matter how skilled you are and no matter what kind of puppet you use. So quality of humor makes for a good ventriloquist and I do not feel that this page will automatically go out and destroy the careers of all vents who are out there today. A few vents have appeared on "America's Got Talent." Although they are skilled, I personally feel they didn't make it through because of their material. They either were not funny or what they were doing is the same ol' same 'ol stuff all the other vents do. See? You need good, fresh, original material! Jeff Dunham keeps his material fresh and is always updating his act. I might also add, that as far as I know VERY FEW people are full-time ventriloquists anyway. There are no real careers to destroy. Most ventriloquists do it for free or do it as a hobby part-time. There are very few famous ventriloquists today ( Sherry Lewis, Paul Winchell, Señor Wences, etc have all died). Jay Johnson from the old tv series "Soap" isn't on television, although he does perform in California. Edgar Bergen was a ventriloquist at the right time in history. You notice that his children didn't go into ventriloquism? Many ventriloquists blend their acts with singing, magic acts, etc. A few do perform on cruise ships, etc. Ventriloquism is a skill very few can make a full-time income, career at. I'm not saying it's impossible, but as you can see on "America's Got Talent", a few vents have come and gone and so far only Jeff Dunham and Terry Fator have stuck out from the crowd. Ventriloquism is a great comedic style, but it's not like magic and to me does not hold the same standards of ethics. This page will not instantly make you a ventriloquist. That takes practice, practice, practice as you will see. But, it will give you an idea of what it takes. Ventriloquism is basically an illusion to the ear, just like magic is to the eye. And, just like magic, it also uses mis-direction to make it more believable. How is this done? 1. First by using a puppet to direct the viewer's eyes over to the false source of the sound. 2. Letter substitutions that boggle your brain to correct the mis-speaks. 1. You may not believe this, but you are 50% a ventriloquist already. Just relax your jaw...relax...relax... OK now gently open your lips slightly. Congratulations! You just spoke without moving your lips! 3. The troublesome letters are : B, F, M, P, Q, V and W right? So how do the ventriloquists do it? By sound substitutions and fast rolling over of the troublesome letters so that your brain will fill in automatically the letter.. Duh? Actually, your brain is so much in control that it automatically fixes a mess-up for you when it comes to words. This is the biggest asset in ventriloquism....peoples brains and ears! Also by being so funny that the humor distracts them from not noticing the letters were not really said. B is replaced with a "geh" sound at the back of the throat. So the word "banjo" would be "gehn-jo" in sound. "I just love listening to banjo tunes." "Duh, there is no such a word in the English language as a "gehn-jo" It sounds like banjo and so that's what I'm going to believe!!! Vent: " Dueling Banjos is the coolest banjo song." Puppet: "I just love listening to gehn-jo music too." The ventriloquist has pre-set the brains of the audience to believe the sound substitution. Do you understand? F = a "th" sound as in fabulous is "thabulous". Some vents use a "huh" sound also deeper in the throat. Example: Fabulous is then "huh-abulous." M = Nah or Neh in sounds like "Master" is "Nah-ster." (really it's "Neh-si-sik-le-e" when you sub the "P" too." P = a "kL" sound gutteral in the back of the throat. Example is "Paint" is "kL-aint." Q = "Koo" sound such as Quality becomes "Koo-ality." V - is a "th" sound also. An example: Victory becomes "Thic-tory." W = "ooh" such as Welcome is "oooh-elcome." So, what do you do when words contain two or more letters that are the problematic ones? (1) Don't use that word and find another one that's easier to say. (2) Speak it a bit fast so that the the secondary problematic letter slurs by and brain will fill in the blanks. Sentence: "I am having a difficult time with my vocabulary exam." First...notice the "V" in Having is not a problem when it's inside the word? It can be slurred a smidge. So that's an OK word. ..with my vocabulary exam ... is the hard part of this sentence. "I'm having a hard time doing my vocabulary test." It's getting easier, right? ;) I realize the pronoun "I'm" is a bit tricky. There's no way we can remove it. :( So the vent is going to just have to say something like "Ein" (Like Ein-stein) for I'm. I know I said "M" - Neh but in this case use a similar sound that works. This is why in *SOME* cases having your puppet have an accent of some sort helps with your illusions also. Now you need to conquer the word "vocabulary" with it's V and B. Here is where the brain helps you. Say "Vocabulary" as "Tho-cag-ulary" with a gutteral in the throat "g". "I am having a hard time doing my tho-cag-ulary test." Is it starting to sound more like vocabulary? What about the "I am" and "My?" Remember the M = neh. "Ein having a hard time doing ny tho-cag-ulary test." Word Endings of "Ing" and "Able"
Now, what about word endings such a "able" or "ing?" The Able is a hard one IMHO. It is A-geh-le. If possible I try to not use it. "ing" to me is the gasoline of ventriloquism. Why? Say "ing" without moving your lips. Pretty easy right? really Blast out the "ing" to mis-direct the sound substitution of the other letter. Example: "I really enjoyed Fishing at the lake yesterday." On the word "Fishing" you say "Th- ishing" but make it "Th-ishING!" That's it. That's the secret. You just substitute those few difficult letters for the other sounds, I just listed above. That does not make you a ventriloquist at all! 1. You must memorize these sound substitutions so they become second nature to you. Rather than me stuffing this page up with sample sentences to give practice for each sound substitution, I just suggest that you practice on lyrics of your favorite songs. You already know the words. So practice saying the lyrics first in your voice, with regular sounds, then practice the same line using the ventriloquist voice you chose and with the substitutions. 2. You then need to find a puppet and a character that you like. 3. You then need to learn to have a dialogue so fast and speedy that you can instantly switch from talking in your NORMAL voice and real to VENTRILOQUIST voice with sound substitutions. 4. You then must not forget your jokes. 5. You then have to co-ordinate the puppet's movements to be realistically human and natural. Tip: I really think that too many ventriloquists try to make their entire routines all words. Analyze how you and your friends talk. Sometimes don't you just well, huff or sigh. Well, make your puppet do that also. We all huff or sigh without moving our lips! 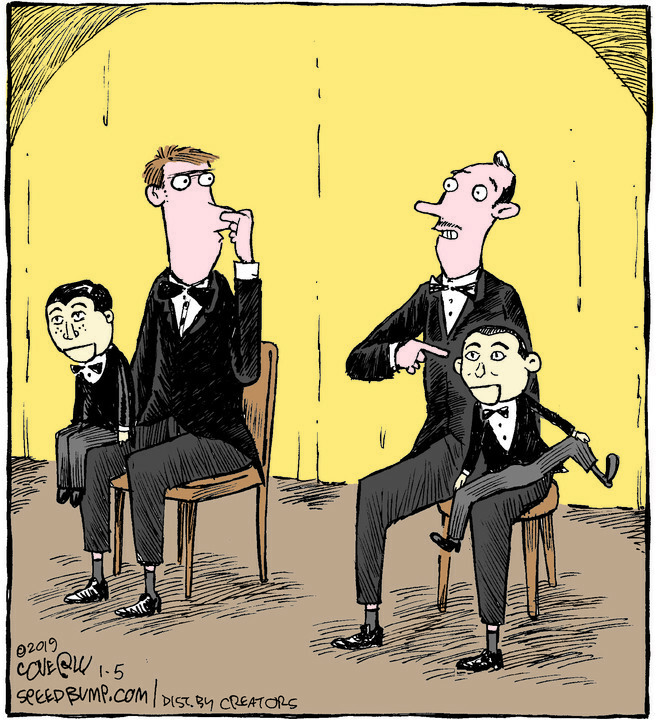 Ventriloquism has been around for hundreds of years. It was called "belly-talking" because it was believed the sounds came from inside the belly. For the most part, they do. You need to work on good breathing and relaxing. I might also ad, that having a dry throat does not work for ventriloquism. So a routine usually doesn't go longer than 10-15 minutes because it's hard on your throat. Singing seems to just fascinate the audience. LOL Well if you have been given a good voice by the Lord, Amen. I wasn't. But singing ventriloquilly is the same as talking, and it takes no extra skill at all. To be a good ventriloquist you must practice in front of a mirror, with your puppet a lot. It is not just about not moving your lips, it is about the entire performance that you are presenting. Give your puppet as many naturally human movements as possible, depending on it's style. 1. Remember that one routine to one group might be hilarious, but to another group they'll just sit there like mold on a rock and not laugh. Try to have several routines ready and cater to your audience. But, do not fall apart if no one laughs. That's life. 2. Study human nature. That's where your best routine ideas will come from. 3. Be prepared to accept that fact that in today's high-tech world, ventriloquism is not as fascinating as it was years ago. If you are learning it to enhance your popularity, I don't recommend it. Learn it to give humor to the world only. skill and bug you to make things talk. I actually had job interviews (my resume showed hobbies etc.) and they wanted me to make the stapler talk or whatever. I actually said, "I'm here to interview for the ____ position in this firm. I am not here to audition." I really felt that many wanted to interview me only so they could get me to give them a free performance? :( I refused to do it. By the way, I always kept my day job. Ventriloquism made extra money but it has never put a roof over my head. So, good luck if you're out for fame! 5. Never tell a joke that you don't think is funny. You can't sell a product that you do not believe in. a long drawn out one full of mediocre humor. 6. Do you do encores? It's up to you. 7. Rule of 3 in humor applies to your routine. Get's old. To make the puppet appear more real, tell your jokes like you'd do it among real friends. 8. I like to tell my 2nd funniest joke first (to get the audience in the mood) and tell them the funniest last to "leave 'em laughging." And, if you forget a line, just ad-lib something until you get to the spot you remember. Or have the puppet say, "You forgot MY line??? How dare you!" I think you get the idea. 9. Use props when possible and try to get a puppet you can change their outfits with. 10. For women, I like to wear red lipstick and when I talk my lines, I well, move them a bit more than I normally would. Why? So when I talk ventriliqually, (and they might move a smidge) they don't look so moving. Finally, men... you all were born with Adam's apples. How to Decide on a Puppet? I prefer the soft cloth ones. As a female I find them easier to use, and carry in suitcases. But some people like the traditional wooden dummies. All are acceptable and frankly as long as people laugh I don't think they care what style of puppet did it. Make your puppet as opposite of you as possible to create a better illusion of TWO different people on stage. Work on different voices. Use one you can change back and forth into easily and doesn't strain your throat. To help create the illusion that the puppet speaks, when possible I have asked that the puppet have it's own microphone. How much you want to spend all depends on your purpose for being a vent, or your budget. Word of mouth also helps. But, in today's world, I chose for safety reasons to stop performing because as a female it got to be well....dangerous in some cases. We get called for a booking and there is no promise that club exists. So you might just want to stick to performing in ONE place or for charities only? I'd like to also add, that when I began, I had a hard time getting people to believe I had some talent. So, what did I do? would fit inside) somewhat worn, but in good shape and peferable with travel stickers. Why? Because when I entered a place with these suitcases, it looked like I had been around and had experience. I created the illusion I had experience before I even did have experience. I have to say, it worked. ;) I still have the puppets in those old suitcases I bought years ago, and have now added to their wear and travel on my own. But the suitcases of the 1940's are deeper than the Samsonite luggage today and work great. Check antique stores too for some good old suitcases with personality and travel wear. Personally, that's up to you. But you need a good word-of mouth in this business, and if people feel they did not get their money's worth, you won't get referrals from one performance to another. Here is how I analyzed it. $100 a performance. Why? It looks amateurish and cheesy. It does not look professional or well-thought out if you toss out a cliche amount. Instead, I would ask questions such as "My fee depends on how far I travel, how long a performance, how many puppets you want me to use, etc." So they'd tell me what I needed to know. Then, I'd wait, and ho hum and say..."OK, there's a base fee and 10 miles to and from, and the time will be late, and it's a Saturday (weekends were more than weekdays) and blah blah..." I then would say, "The peformance will cost you with 2 puppets ... $168.50." And then I also had the problems of people who didn't want to pay me (or claimed they could not afford me) and so I said, "Well, here is what I can do. After the performance we'll just pass around a hat. How's that?" And then they'd say, "But you could get more than you're originally asking?" And I'd reply, "Yes that's true, but I could get less. This is the what I call taking a gamble on my own ability to entertain. I'm willing to do that." Most of the time, when people felt I could earn MORE than my asking price, they gave me my asking price! Would you believe my family physician actually asked me, "How do you do it?" when he was giving me my annual physical and looked in my throat? He didn't see any special feature in my throat or tonsils (I still have mine!) that he could figure out would give me this skill. I just smiled and said, "Do you tell all your secrets doc?" One time after a date the guy leaned over me and presented his line in an attempt at a good-night kiss, "I bet you're a great kisser." I asked, "Why?" And his response was, "Because you're a ventriloquist and well you've got all that lip control!" I actually burst out laughing so hard, that well...he never got his kiss. First of all, this page wasn't put up so I could get bookings for performances. I don't do this anymore. I have my reasons. But I reinvented myself as a cartoon, Brownielocks now. No one can become a good ventriloquist simply from reading what I have on this page. It takes practice, practice, practice until you can, without hesitation, change from your normal voice and regular English to the puppet voice and ventrilogually sound substitutions. Knowing how it is done does not ruin a routine IMHO. We know magic isn't magic but we still enjoy it. Reading how to do a card trick doesn't make you a sudden expert. You need to practice that trick over and over. routines in them through the Maher Studios. I am not putting this here to sell books, as I make no money. THE MAHER SCHOOL OF VENTRILOQUISM SITE. I used to have several pictures of me with my puppets on this page. Those were removed due to misuse by some visitors. lighter, and more flexible for various creative ideas. Oh, and they're cheaper! we have found and liked from other cartoonists and hope you do too. All rights to these cartoons belong to the respective cartoonists. Here's another cartoon from another favorite cartoonist, Mark Parisi. Of course we love Ziggy! This page is not meant to replace any professional ventriloquism courses. Maher School of Ventriloquism in Littleton, Colorado. I recommend their course if you are serious about learning. way replaces it. This just gives you an small peek at what ventriloquism is like. They also have information on purchasing puppets and ventriloquist conventions.